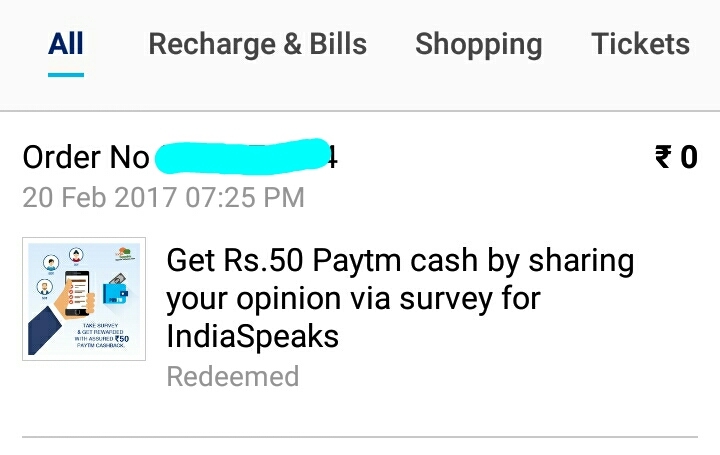 Hi Guys, Today IndiaSpeaks again started to Providing Free Rs.50 Paytm Cash .Just for completing simple survey. In this Offer You Are Getting Free Rs.50 Paytm Cash From Indiaspeaks.net. Many people’s looted paytm cash previously from this website. So don’t waste your time loot it fast!! Just follow the below instructions..
2- Click On Get the Deal For Free @ Rs 0 and Click To proceed it. 4- On That Page You will get the Sign up Link Of IndiaSpeaks With Survey Link, Just Copy that Link and Register on IndiaSpeaks.net from that Link And Complete The Survey. 5- Enter your Name, Email Id, mobile number During SignUp At indiaspeaks.net. 6-Now Verify your Email, mobile and Login your account. 7- done ! !, You will get the Free Rs 50 Paytm Cash from India Speaks within 24 or 48 working hours. -Paytm cashback will be rewarded only to those who have completed the survey. -The cashback will be added after the validation process which might can take 7-10 working days. -Participation in the Campaign open only for three days (Start date: 20th Feb 2017 to 24th Feb 2017). -Offer is valid for all user. -Applicable only one time per user during the offer period. -Mobile number needs to be verified to be eligible for cash back. -The survey is required to be filled form your mobile device only. -Submission of survey from desktop will not be entertained.